Bobby Boido moved to Tucson in 1970 at the age of 14. His hunting career started at age 8 when he would follow his dad through the oak covered ridges of Sonora, Mexico to hunt Coues Deer. He has harvested 9 of the "Big 11" animals in Arizona, only a Buffalo and Rocky sheep to go. His passion has been to hunt as many species as he can, having ventured to South Africa where he took 7 plains game animals. Growing up reading Jack O'Connor and buying a .270 , his dream came true in 2006 when he went to the Yukon to take a Dall sheep. He was lucky enough to draw a desert sheep tag, taking a very mature 10 year old ram, so he is stuck at a half slammer. He has hunted in 9 states in the US, 3 provinces in Canada, South Africa and Sonora. He is past president of the Southern Arizona Varmit callers club, past president and current Executive Director of the Arizona Chapter of Safari Club International, and is a life member of the NRA, SCI and the North American Hunt Club. Bobby has been a sportsman now for over 50 years! Bobby started Coues Outfitters with his friends and business partners in 2013. He has been guiding hunters for over 30 years. Speaking fluent Spanish, Bobby helps make the license and permitting process for hunters in Mexico go smoothly. Gary has enjoyed hunting for over 30 years. 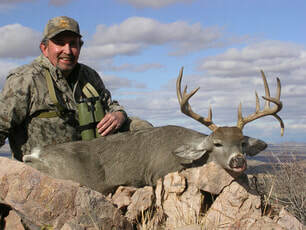 He has been especially lucky in drawing tags in his home state of Arizona for bighorn sheep, elk and antelope. Coues Deer hunts are some of his absolute favorite because of the challenge required to find them. He finds adventures in Mexico especially fulfilling because of the experience, culture, cuisine and people. Gary also volunteers as a mentor for AZ Game & Fish sponsored youth hunting camps. When not planning hunts, he runs a marketing and social media company that specializes in non-profit conservation groups and other outdoor-related companies. ​Tavo is our cook for all of our hunts in Mexico. Often described as the "real MVP of the operation" Tavo takes great care of hunters in camp. From breakfast burritos to carne asada, he will keep you full of traditional Mexican meals throughout your stay! He also knows his way around the grill and has no problem with special orders or dietary needs. Tavo also helps out with a number of projects around the ranch house throughout the day.